The Joke's on Bob Tisdale! 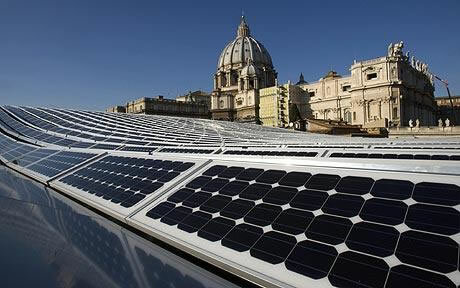 His papal mockery falls flat in a sea of solar panels in The Vatican, World's Greenest State. Bob Tisdale had a shot at mocking Pope Francis by putting up a recent photo of him with the Harlem Globetrotters (archived here). The photo made headlines last week, when Pope Francis was made an honorary globetrotter. He was only the ninth person (and the second Pope) to be so awarded, according to Latino Fox. This got under Bob's skin - is he a globetrotter fan? He's not a fan of Anthony Watts' religious leader, that's for sure. ...Will the Vatican be adding solar panels atop the Sistine Chapel and a windmill at the peak of the obelisk in Saint Peter’s square? They should lead by example. A little Google would have gone a long way. The Vatican has installed panels to power all of its 40,000 households, making it arguably the greenest state in the world. Some are installed on top of the building shown in the photo above - that happened seven years ago in 2008. There is also a solar plant installed on 740 acres near the medieval village of Santa Maria di Galeria. Note: It looks as if the 40,000 homes / 740 acre solar farm hasn't happened. I don't know if it is still on the drawing board or not. See comment by Lotharsson below. Oh, and Renault gave the previous Pope an electric vehicle. This isn't the first time Bob Tisdale failed the Google test. Say, Sou, I was wondering if you saw a recent guest post at Judith Curry's place that seems to assert that we don't know how much of the CO2 in the atmosphere is even ours? I'd love to see your take on it, and also on Curry's comments and conversations afterwards. It seems to me she has really jumped a shark here. Am I wrong? I am making no personal judgment on Fred’s analysis; I find Greg Goodman’s comments and ensuing discussion with Fred on the original blog post to be interesting. If you're so "concerned" that "we don't know nuffin", Judith, why are you not shouting the no-change scenario from the rooftops?! It's pretty crafty in that she's not really lying in the sense that she's not making a scientific judgement of the analysis in terms of whether it's possibly accurate, she just finds it "interesting. ", which is neutral. "You should have told that to nasa before they spent all that money on their new satellite." In response to ATTP's comment that "I don’t think that the natural variability is not considered. I think that it is considered, and that it is quite well understood. It, however, does not – and cannot – explain the long-term rise in atmospheric CO2 which is very obviously anthropogenic." "Well there is plenty of natural variability on timescales of a decade to centuries. The anthro CO2 effect on temperature shows up in the ‘fingerprints’ after about 1980. Seems to me that natural variability on these timescales could be playing an important role in what is going on. We don’t really know how the carbon cycle feedbacks work (this budget stuff is really zeroth order too simplistic IMO)"
"good point. In previous comment, mosher said we are wasting time revisiting this. I disagree, if there is something wrong with the IPCC argument, it has huge policy implications." "I think it unlikely that 100% of the increase in atm CO2 is caused by humans"
She's an idiot. I'd gladly say so to her face when I meet her in real life (unlikely, but not impossible). That's definitely jumping-the-shark territory. There are uncertainties in the science of climate change, but the origin of the CO2 increase isn't one of them. That one is locked solid. Not only that. There. are. no. models. involved. Just straightforward measurements of isotopes and some almost elementary arithmetic to work out percentages. My schadenfreude is working overtime -- this Pope is such a lemon for so many hard-core conservatives. I’m not buying the idea that the way to understand the climate is to look at what our scarce, inaccurate proxies say happened nearly half a million years ago. For me the key to understanding the climate is to look at what happens on a daily basis. They seem appropriate in their micro location-on a barely visible roof- and in their wider context in as much Rome is a pretty sunny place. In the UK we have just had a large and pristine piece of beautiful countryside locally ruined by these highly prominent panels. In rainy South West England, where by far our greatest power demands are in the low light levels of our cloudy winters, they are an expensive irrelevance. Nowhere in the UK is further than 70 miles from the sea which could give us all the renewable power we need. However research (let alone implementation) of wave and tidal power is minimal. I would have thought Australia ideally placed for solar power stations in as much you have a sunny climate, a lot of land and a population largely situated in cities making solar power station location and distribution relatively straightforward. As far as I'm aware you are way behind the cloudy UK in your development of this technology. WUWT? WUWT is our "climate change is crap" PM Tony Abbott. Some governments are supportive. Home owners have embraced solar technology, too. Nyngan, NSW - the biggest so far. BTW - if you read the article, Tony, you'd have seen that the Vatican's rooftop solar of 2000 panels is the small installation. The real energy booster is on 740 acres. What is the size of the solar installation you are complaining about, out of interest? And where is it? Got a link? Is it this one? If you are at ground level you can’t even see the solar farm behind the hedge, because it’s 2.2m high. People driving by wouldn’t even know it’s there,” he said. I must admit I find it very weird that a person would object to solar panels on unproductive agricutlural land, because they are supposedly unsightly - compare the picture above with the one in the article below. Solar and wind complement each other in northern Europe: less sun but more wind in winter and vice versa. Good point, Nigel. South Australia, the driest state in the driest inhabited continent, has invested quite a lot in wind. It's probably up to 30% of electricity by now, beating initial target by more than 100%. "...we have just had a large and pristine piece of beautiful countryside locally ruined by these highly prominent panels." Bob should leave the comedy routines to Anthony "it's Russian steampipes" Watts, Ronald D. "OMG it's insects" Voisin, David "funny sunny" Archibald (and Jo Nova's Force X and the Notch). Ah yes. The Masters. Great comedy writing will die with them. Sou You omitted that fine jester JC. Today she linked to Maurice Newman. Late to this - only came across it when a Deltoid denialist talked about Booker's disingenuous critique of the Vatican in the Telegraph the last day or so. The Vatican has installed panels to power all of its 40,000 households, making it arguably the greenest state in the world. I am fairly sure that this needs correction. There are two issues here. The Vatican proper is said to have only 800-900 inhabitants, so I have no idea what the 40,000 households figure refers to. Secondly, there were a bunch of solar panels installed on a prominent Vatican building in 2008 or 2009 but they are about 220 kW in capacity (about 300 MWh/year). Solar heating/cooling/power was also installed on some other buildings later, along with some energy efficiency and emissions offsetting initiatives. At around that time there were reports that the Vatican was considering building a 100 MW solar power plant on land it owned in Italy which was associated with the "40,000 households" figure in a bunch of reports. However a bit of Googling and a peek at Google Earth suggests those plans have not been implemented. Thanks, Lotharsson. I've added a note to the article.